The Walter J. Black Editions were reprints of seventy-three of Zane Grey's titles with one additional title appearing as a First Edition. 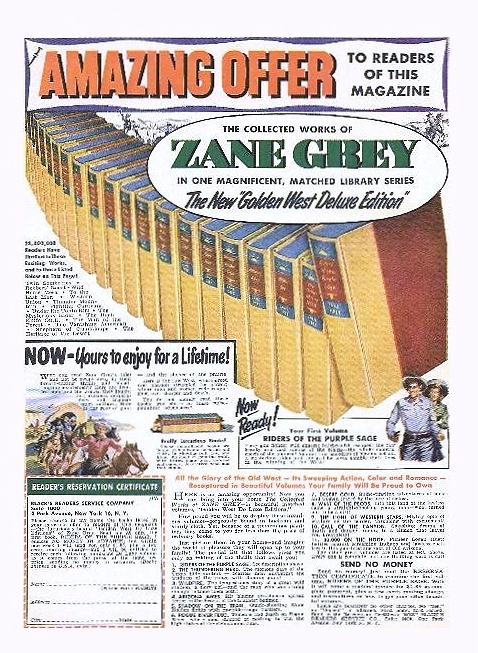 The series also included a biography of Zane Grey. Produced in the 1960's, they were bound in red and tan cloth and originally came in a rice paper cover. Most of these books have little value, but the last thirteen in the list below are substantially rarer and command higher values. Two titles, The Wolf Tracker and The Camp Robber are worth a fairly high value. The Wolf Tracker is almost impossible to find in the original Harper's Edition, so this title is, in many cases, collected by collectors who feel they will never find the original first. The Camp Robber is a First Edition in the Walter J. Black series. It was never published anywhere else other than a magazine serial. It is therefore highly collectible. The ZGWS is has received many requests concerning the value of Walter J. Black Edition books. To gain a better understanding of the values of these books, we recommend that you contact one of our Member Book Dealers. However, most of these titles in average condition can be purchased for $5 - $6 per book. The last 13 titles in the list below can command higher prices, especially if they are in excellent condition Books in mint condition with the rice paper cover are becoming very rare and command much higher prices. We have had reports of complete sets of the 75 titles in mint condition still with the rice paper covers bringing in excess of $1000. We have also heard of mint copies of The Wolf Tracker and The Camp Robber bringing more than $100 each. The ZGWS makes no guarantees or claims about the value of these books. We suggest that you do not be disappointed when you are told that your Black Edition books are only worth $5 each. Seek professional guidance on values from our Member Book Dealers.